Taipei, Taiwan, May 16th, 2014 – ASUSTOR Inc., a leading innovator and provider of network storage solutions, has announced the establishment of a US technical support center in order to provide optimal support and service for all ASUSTOR NAS users in the United States. 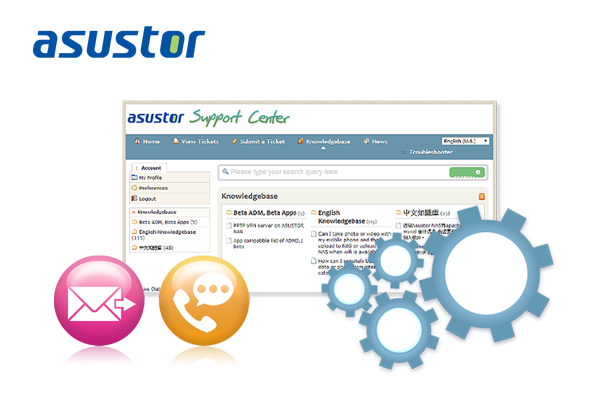 Users can call (toll free) or email the support center to receive instant and professional technical support from ASUSTOR. A dedicated team of professional technical support engineers will provide solutions to any problems being reported. "We consider this as an important step in better serving our US customers," explained Allen Yen, Sales Director at ASUSTOR. "We are committed to providing the best user experiences and will continue to strive to enhance support and service to all ASUSTOR users in the US and around the world." ASUSTOR NAS are the first NAS devices in the world to be designed entirely around an App-based concept. Built on a stable and high performance hardware platform, ASUSTOR NAS devices provide users with an intuitive UI that closely resembles the simplicity enjoyed on most tablet computers. Furthermore, users can download any NAS Apps of their choice from ASUSTOR's App Central, expanding functionality and creating a customized device for themselves. Currently, App Central contains over 126 different unique Apps with categories ranging from social networking to office productivity to digital home entertainment and more.